The American Legion post in Greenville, Texas is named after the World War One soldier “OTHO MORGAN”. Pvt. Otho Morgan was born in Hunt County, Texas on January 13, 1891. He received his early education in the county public schools, finishing at Burleson College and the East Texas Normal in Commerce, Texas. He was the son of J.D. and Ophelia Morgan of Greenville, Texas. When the United States declared war on Germany he joined the Army on September, 20, 1917. He was ordered to Camp Travis, San Antonio, Texas where he was assigned to A Company; 359th Infantry which is part of the 90th Division. He trained at this location until June 1918, when his division was ordered to Camp Mills, which is the place he embark for his overseas duty. The division would train for about six weeks after their arrival in France. Around the middle of August 1918 he and his comrades were ordered to relieve the First Division. According to records the soldiers of the 359th Infantry, and of the whole 90th Division, showed absolute fearlessness and devotion of duty. Pvt. Morgan’s principal participations were in the St. Mihiel and Meuse-Argonne campaigns. On September 26, 1918, during the Meuse-Argonne campaign he was wounded by machine gun bullets in both lower limbs and in the left thigh. A short time later he was picked up by German stretcher bearers and taken to a hospital in Metz. While recovering he was able to write four postcards home but the family didn’t receive them till the war was over. He died of his wounds on October 23, 1918 and was buried outside of Metz until some years later when his body was returned home. Our post is dedicated to improving the community through our post activities. During the early years the Otho Morgan Post# 17 supported numerous civic functions from the local YMCA to County Beauty Pageants. They supported legislation that would eventually create the Veterans Administration, and aided returning soldiers in finding work and filling out paperwork for pensions. The Greenville American Legion post was a central figure in Greenville Community activities throughout the 1920’s and 1930’s. They would be involved in controversial issues like soldier desertion and Japanese Immigration. The role of the American Legion has grown over the years but it remains the same. We want to not only support our veterans but also the whole community. Its major focus is on programs that benefit veterans, their families and the youth of America, instilling in all an enduring belief in God, Loyalty to America and the basic American principles of Freedom, Justice and Democracy. 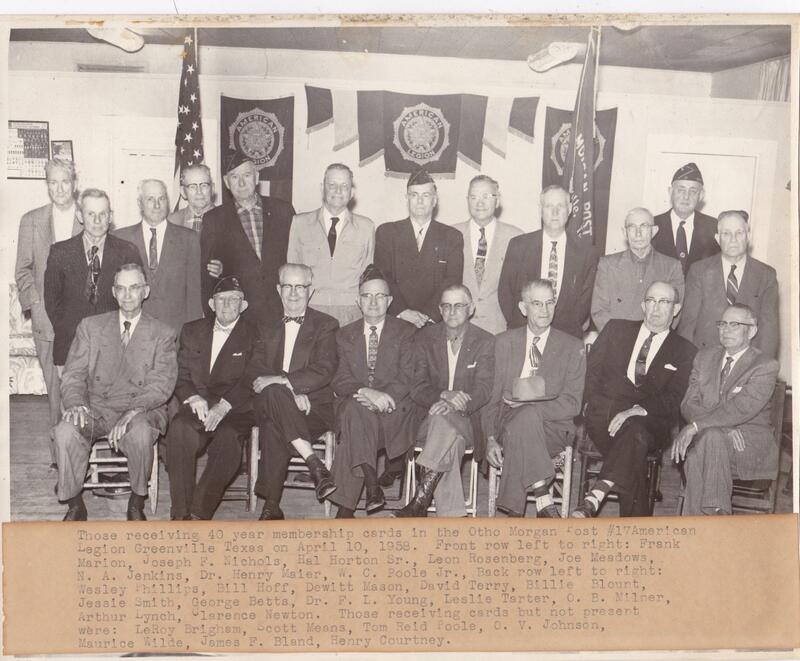 Through the efforts of the American Legion, the U.S. Veterans Bureau, forerunner of the Veterans Administration was created. Today the American Legion continues to Lobby for adequate funding for Veterans Affairs. On the Post Level, we support several charities through donations, we support local children and youth activities through the Boys and Girls Club and the YMCA. We support the American Legion Boys State and Oratorical Programs. The Ladies Auxiliary supports Girls State Program. We support our local community by supporting “Bra’s for Cause”, donating money to the local fire department and annually we recognize the top Policeman, Fireman and EMT of the year. We also provide toys to children in need within our Local Community. In 2015 we spent over $4,000 on toys that helped over thirty families. As a post we help support our veterans by providing money to veterans in need, we also bring in Veterans from the Bonham Hospital for meals around the holidays and also in the spring. As a post we sponsor the Hunt County Honor Guard which provide services at community events and veterans funerals. Not only do we sponsor them but many of the members in the Honor Guard are also Legionnaires. Also the Otho Morgan American Legion, Auxiliary, Sons of the American Legion and the Post Riders are active at the District and State Levels.